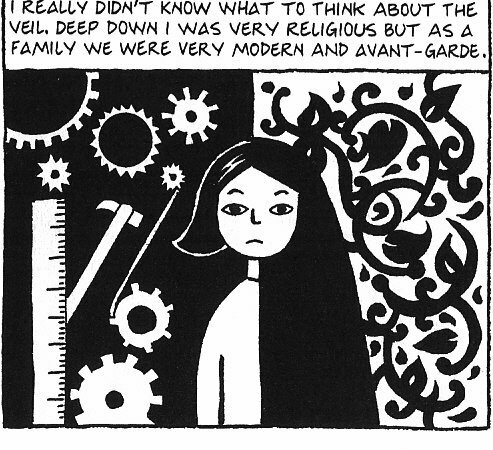 I’ve been meaning to read Persepolis for some time now as I’m trying to widen my knowledge of graphic novels and the book is often mentioned. From the first page I could tell that this would be a book that I would return to again and again – there is a richness to both the story and the pages that will only be discovered on multiple viewings. The book tells is an autobiographical account of Marjane Satrapi growing up under the shadow of the Iranian theocracy. The illustration is simple to the extent that it is in black and white but beyond that it inventively echoes scenes visually throughout. Without the imagery the story would be diminished as it brings Iran alive to those who have never had a chance of seeing both public and private aspects of its culture. Her parents were liberal and encouraged Satrapi to be educated despite the theocracy attempting to cut down on women’s rights both through the enforcement of the veil and a restriction of their movements. Satrapi’s parents eventually send her to Austria in the hope that she can experience freedom there that is no longer possible in Iran but this transition also presents Satrapi with difficulties. This is both a bildungsoman and an exploration of the hidden split in Iranian culture – she chronicles her increasing isolation from both cultures and a struggle to understand her evolving identity. Although she adapts to Western culture as she goes to university, lives in a house of gay men and has a boyfriend Marjane remains an outsider to her Austrian life. However, on returning to Iran she finds those friends who she has looked forward to meeting again are now also strangers to her and look down on her “Westernised” ways. The considered narrative is emotive whilst also restrained,uncovering a side of Iran that remains hidden too those who only experience it through the news. It recalls those who were locked in prison or died at the hands of both the Shah and the theocracy, the continued attempts at rebellion that must become more secretive as protests become too dangerous and parties involving alcohol appear too risky. Instead, in one instance, like minded individuals meet and hold private life drawing classes in response to the regime preventing women attending. They refuse to allow their lives to be narrowed due to close-minded leadership. If there is any one that sneers at graphic novels they only need to be handed a copy of Persepolis to be proved completely and utterly misguided. This book will remain relevant and fresh for many years and is an excellent entry point for those who wish to understand aspects of Iranian culture, both old and new, better.